The word on the street is that charcoal isn’t just for grilling anymore and we can’t get enough of it! Charcoal products have seen a major increase in the beauty industry over the past few years. Everyone from Boscia to Sephora is incorporating this super fun trend of both black and white charcoal ingredients. This trend is great because charcoal can really help your makeup routine in a major way. Charcoal is a rock star ingredient as is used for teeth whitening, skin and body health, and even aids in anti-aging. Charcoal works with all skin types; including sensitive skin and oily skin, too! So, *drum roll, please* as we gear up to present to you 10 charcoal products and their benefits that you are simply going to adore. One of the more popular ways to use charcoal is for teeth whitening. BLKDIAMOND Activated Charcoal Powder is a great product for teeth whitening. This powder is wonderful because not only it is vegan but it will last 1-2 months and incorporates organic lemon and organic lemon myrtle. This product will not only make your smile brighter but make your mouth feel top-notch all around. You’ll be smiling with confidence in your photos after using this charcoal product. 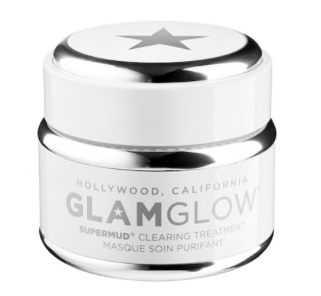 If you are tired of those little blemishes that never seem to go away, we suggest you try GlamGlow SUPERMUD Activated Charcoal Treatment. This product is fantastic for individuals who want to see a reduction in pore size, have oily skin, and are prone to acne. The Activated-X charcoal formula allows for your skin to breathe and look its healthiest. A great use for charcoal is as a makeup eraser. We suggest using Boscia Charcoal MakeUp Melter Cleansing Oil Balm. This product is a perfect for everyone as it can be used on all skin types. It detoxifies skin by using both black and white charcoal. It is free from preservatives and artificial fragrances and even removes waterproof mascara with ease! We all have those days when we feel our hair is just blah. To combat these not-so-excited hair days, we suggest you try IGK First Class Charcoal Detox Dry Shampoo. If you have issues with oily hair then this will help to eliminate that with the activated charcoal ingredients. This product also has white tea powder, which helps soothe the scalp. Added bonus that this product is cruelty-free and protects your hair from UV rays! Once you’ve finished your makeup look you’re going to want to use a setting spray that locks that gorgeous look into place! Boscia White Charcoal Mattifying Makeup Setting Spray is just the product to help you do that. Use this product on all skin types. The white charcoal is especially great for those with sensitive skin as it helps to soothe any breakouts. This product has a matte finish and helps to control oil. With all the fun masks and sprays it’s important to have the applicators to place your product. Sephora Collection Mini Deluxe Charcoal Antibacterial Brush Set is perfect for those on the go! The antibacterial purposes of the charcoal will keep your brushes as clean as possible. This brush set comes with 6 brushes and a carrying case which is perfect for traveling to your next destination! If you are more into sheet masks than mud masks, Dr. Jart+ Pore Minimalist Black Charcoal Sheet Mask is the ideal product for you. The box comes with 5 masks that are ideal for all skin types. The main goal of the mask is to reduce pore size and make your face feel flawless. It not only makes your pores appear smaller but also helps with skin elasticity. Some shampoos are filled with harmful to your hair chemicals. BRIOGEO Scalp Revival Charcoal + Coconut Oil Micro-exfoliating Shampoo is the product we’ve all dreamt of. This shampoo works on all hair types, so don’t worry about that! The benefits of this product are incredible. The shampoo hydrates and smoothes while the charcoal detoxified the hair while drawing out impurities from the scalp. When thinking about your completed look you will want to pay attention to your nails. Nails, Inc. Nail Polish Fueled By Charcoal is a killer product to make your nails look on point! With the use of charcoal, this nail polish gives off a gel manicure effect and protects against pollutants; it is also without parabens. The Portland Square - vibrant orange charcoal color is a great one for summer. There is nothing like a spa day from the comfort of your own home. ORIGINS Clear Improvement Active Charcoal Mask to Clear Pores is a great recharge for your face. If you feel that your skin is dull and dry then this is the product for you. It will help to detoxify your face from environmental toxins and refresh your skin to it’s ultimate. For best results use this product 1-2 times a week.